If you haven’t heard, Flavia had a big change in their coffee & tea flavors. Today, I’ll just share with you on the new coffees. This will be a shocker for many of you, but all the old Flavia coffee favorites have gone away! Sorry, but it’s true. Don’t worry, you can still get single cup filterpacks / freshpacks for your Flavia coffee brewer, however, the flavors of coffee have changed. Even the names of many have changed. For those where the name hasn’t changed, just know this: the recipe of that coffee (example: Colombia, French Roast, French Vanilla, etc…) has changed. Ya see, Flavia has “adopted” the gourmet coffee tastes of Alterra Coffee Roasters for use in their exclusive single cup systems. “Why are they fixing something that ain’t broke!” That’s what I said. Flavia coffee is so good and easy, what were they thinking? Well, since I didn’t invent this amazing idea we call Flavia, they think they know more than me; so, I guess they have a point. We all know change is hard, but they have gone overboard to make sure this change is a good one. 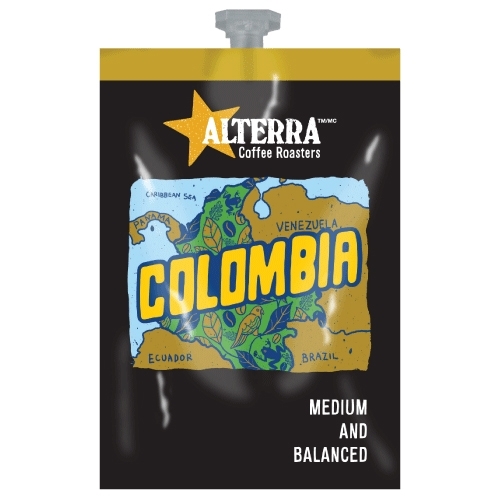 Alterra Coffee Roasters is very popular in the midwest. They have coffee shops similar to Starbucks and their own crazy following of coffee lovers. Flavia is now using the name Alterra on the outside of the freshpacks and the recipes of Alterra on the inside! OH, the freshpacks have some cool, new designs as well. I’ll drop a sample here to see. There is still a great selection. Flavia still produces every coffee pack that exists for all of the Flavia Drink Stations. They are even made in the same buildings, on the same production lines as before. You’ll just see a new name with the new tastes. Kinda scary and exciting at the same time, ya think? We’re all making the change together; so relax and know that the CoffeeASAP.com team is on it. We look forward to experiencing it with you!